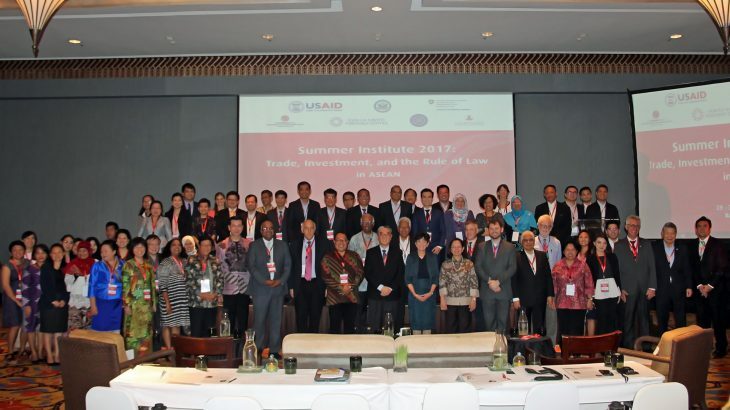 Bali, 29-30 January 2018 – The Human Rights Resource Centre (HRRC) hosted the 2017 Summer Institute in International Humanitarian Law and Human Rights (Summer Institute) with the theme “Trade, Investment, and Rule of Law in ASEAN” on 29 and 30 January 2018, in Conrad Hotel, Bali, Indonesia. H.E. Ambassador, Ong Keng Yong, Chairperson of HRRC’s Board, and Prof. David Cohen, Director of WSD Handa Center for Human Rights and International Justice at Stanford University and HRRC Advisor, welcomed the participants to the Summer Institute, composed of esteemed representatives from the ASEAN Senior Economic Officials Meeting (SEOM), ASEAN Intergovernmental Commission on Human Rights (AICHR), ASEAN Commission on the Promotion and Protection of the Rights of Women and Children (ACWC), ASEAN Committee on the Implementation of the ASEAN Declaration on the Protection and Promotion of the Rights of Migrant Workers (ACMW), business sector, government ministries, civil society, and academia. Mr H.E. Dr. Yvonne Baumann, Ambassador of Switzerland to Indonesia and ASEAN, delivered the keynote address, expressing the crucial need for enhanced cooperation between government and private sectors to build a competitive but sustainable business environment that respects rule of law and human rights. She exhorted the different sectors to work together towards common goals to ensure that economic development is broad-based, sustainable, and inclusive. Delivering a message on behalf of the SEOM, H.E. Ms. Sulaimah Mahmood, SEOM Chairperson for 2018, addressed participants on the work and progress of the ASEAN Economic Community (AEC), stating that ASEAN has come a long way since its inception in 1967 and there is great potential for continued economic growth in the region. While challenges to the AEC remain, ASEAN Member States continue to strive to hurdle these together. She emphasised that Singapore’s focus as Chair this year is to build on the good works accomplished in the previous years, and ensure that ASEAN remains relevant with increased connectivity in the region. The first day of the panels featured discussion on opportunities and challenges for responsible business in advancing the rule of law, how the business sector can be partners for a more resilient and inclusive economic growth in ASEAN, and good governance and human rights in the emerging digital economy in ASEAN. The second day sessions, meanwhile, tackled the rights dimensions in trade and investment and the need of the different sectors to for greater inclusivity and resilience as the ASEAN strives to realize its 2025 vision of a rules-based, people-oriented and people-centered community. The conference culminated in a plenary session, facilitated by Amb. Ong Keng Yong and Dr. Tim Buerher Chief of Party of US-ACTI, where participants actively engaged in a constructive exchange of insights on the challenges and the ways to move forward towards the promotion of rule of law and human rights in businesses in the region. The Summer Institute is hosted by HRRC in partnership with the WSD Handa Center for Human Rights and International Justice at the Stanford University, Udayana University, and the East-West Center. 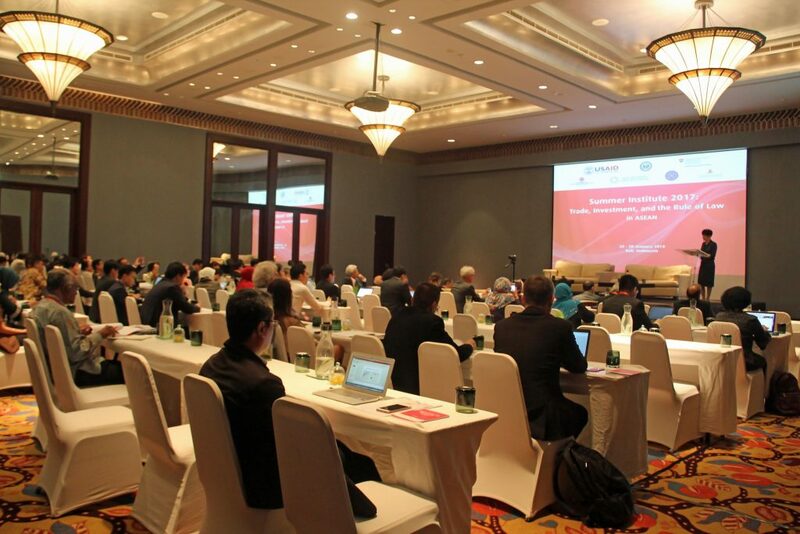 This event is made possible through the generous support of the ASEAN Connectivity on Trade and Investment (US-ACTI), ASEAN – U.S. PROGRESS, the Ministry of Foreign Affairs of Singapore, and the Embassy of Switzerland in Jakarta. ACMW, AEC, AICHR, ASCC, ASEAN, ASPC, Business & Human Rights, News, Rule of Law, Trade and Investment. permalink.